The Committee for the Historian is publishing Choosing the Good Portion, a book telling the stories of many women who have made important contributions to the life of the Orthodox Presbyterian Church over the years. 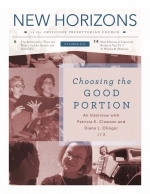 New Horizons editor Danny Olinger here interviews the two editors of that volume, Patricia E. Clawson and Diane L. Olinger. At the end of this month, many Orthodox Presbyterians will celebrate Reformation Day. October 31 marks the day that Martin Luther nailed his ninety-five theses to the door of the Wittenberg church in 1517. While this has become a common way to date the “birth” of the Reformation, it is rather arbitrary: the thirty-four-year-old monk was not calling for separation from Rome, but simply inviting his academic colleagues to debate the practice of selling papal indulgences (certifications that one’s sins have been forgiven).